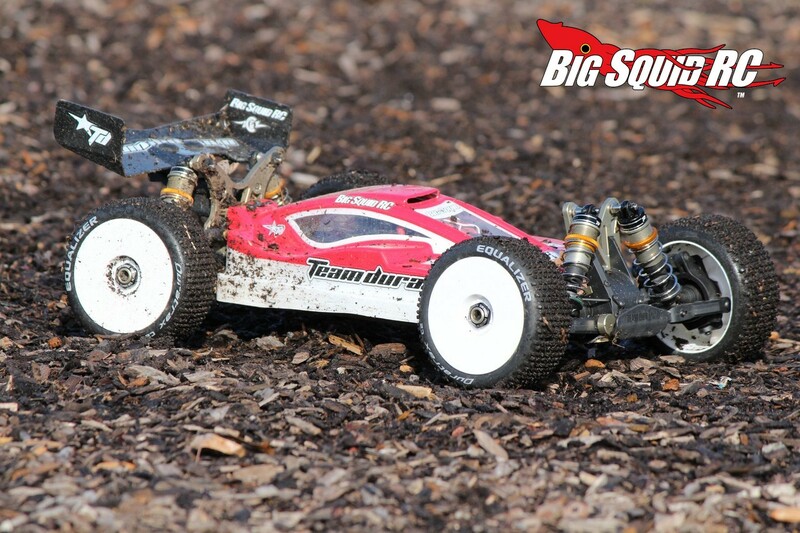 Review – Durango DEX408v2 8th Scale Electric Buggy « Big Squid RC – RC Car and Truck News, Reviews, Videos, and More! 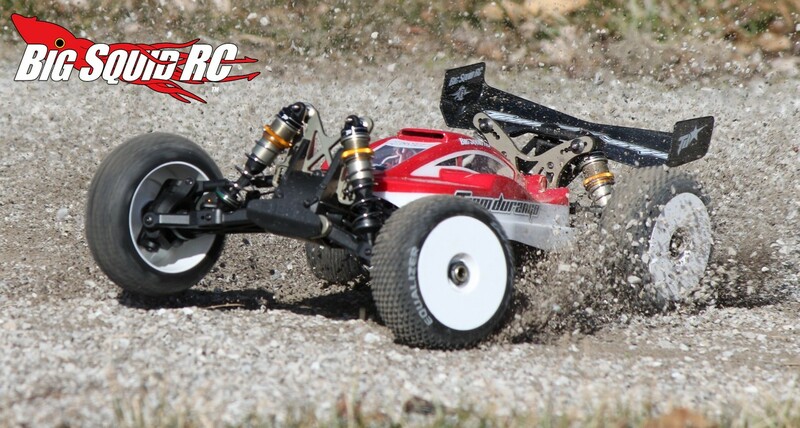 Yes, Team Durango is world renowned for their uber racing machines, but can their high-end DEX408v2 electric buggy also make a good bash machine? Is it fast enough to own the local bash spot? How does it jump? Can it takes huge hits like a only a good bash machine can? Now with video! Build Quality: With a kit the build quality in entirely in your hands. As far as parts quality went, the Durango was top notch with one exception, an ill threaded shock cap. Set-up Notes: Because the big Durango is a top shelf buggy, we went with all top shelf equipment. 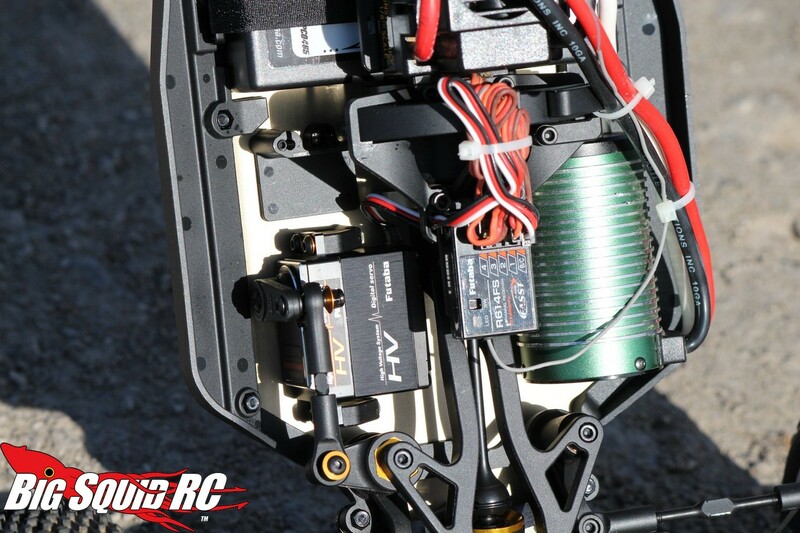 For crazy power we installed a Castle Monster ESC and 2600kv brushless motor. 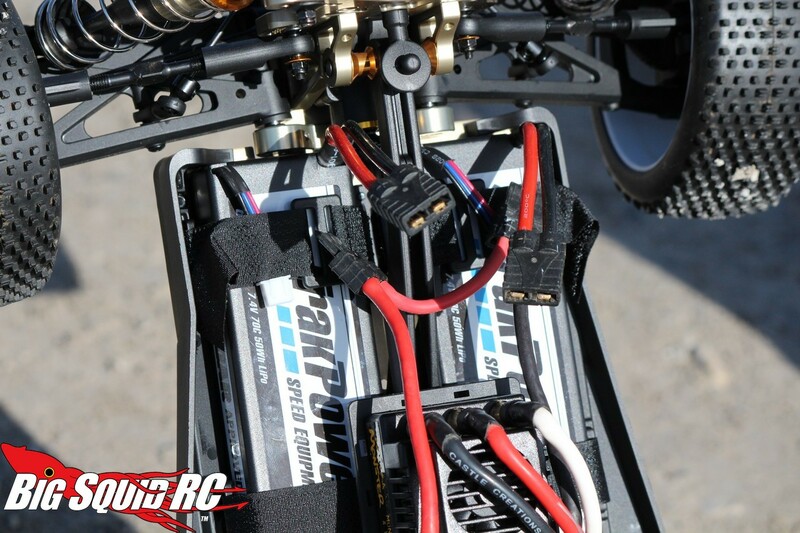 To fuel the Castle gear we used a pair of TrakPower 2S 6800mAh Lipo batteries. 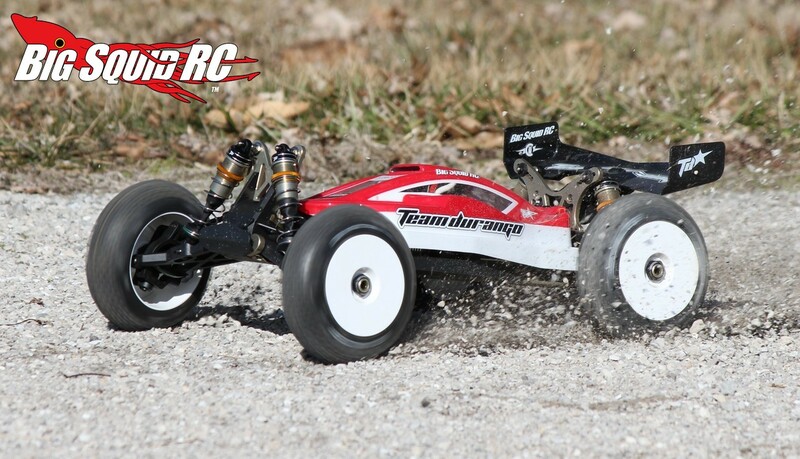 For steering duties we enlisted a very trick Futaba S9353HV servo, and to control the animal we used a Futaba 4PK Super R. Charging was handled by an TrakPower VR-1 and we used Duratrax Equalizer tires to provide the traction. Turning: I hate vehicles that leave little to complain about, and while I would love to find fault with the Durango’s steering, I would have to stretch it to do so. The DEX408v2 is set-up out of the box for loose surfaces and it turns exceptionally well there. I would like to say it is the best turning vehicle we’ve ever tested, but I think overall it would have to be the second best. 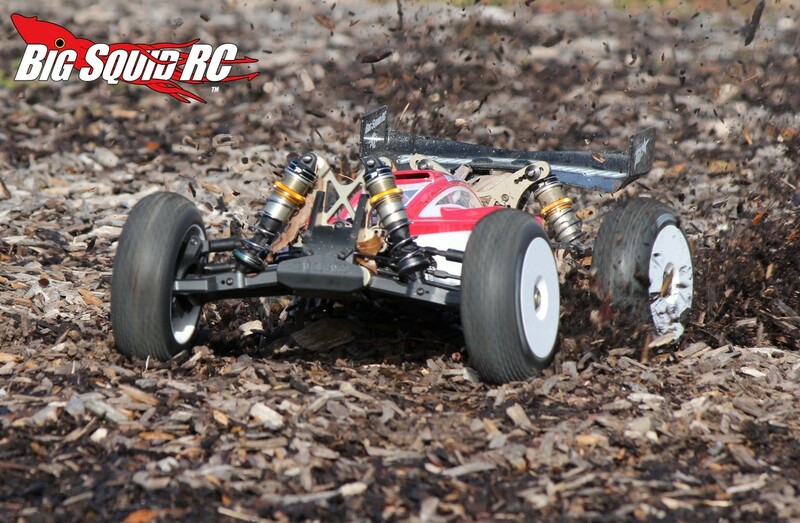 On loose surfaces the front end has a ton of traction, it sticks well even on small rocks and deep loamy dirt. The Durango eats up sharp corners, and carries ridiculous speed through sweepers, there just isn’t anything to complain about on low bite surfaces. The only complaint we had was a bit of excessive roll on high bite, but that is easy tuned out if needed. Overall, the DEX408v2 makes you feel like Superman in the corners, it carries lots of speed and is super easy to drive fast. More than one of our testers described its cornering as “stable”, like you had to go into a corner obscenely hot to get it out of shape. The Durango was even easy to get out of corners after stabbing the power wayyyyy too hard. Jumping: Best we’ve ever tested, I think that sums it up nicely. The Durango tends to launch flatter than anything else we’ve tested, even on ultra-bumpy jump faces. Moderate landings are soaked up like they didn’t even happen, and the DEX408v2 can be landed quite sideways without it flipping over. 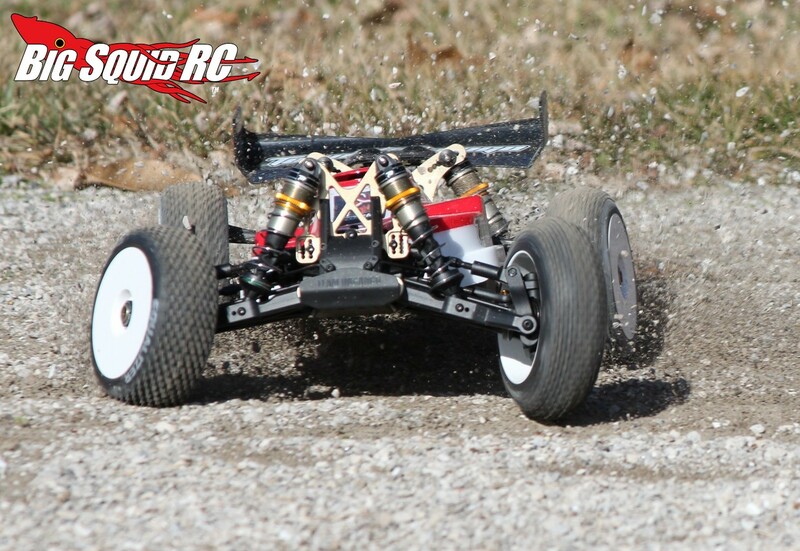 In the air, mid-air corrects are precise, and stiff winds don’t affect it as much as other buggies. For bashing purposes, the fantastic air characteristics make it super easy to jump. Also of note, while you can backflip the DEX408v2, that wonderful center diff that helps make it jump so well makes it harder to back and front flip than other 4wd vehicles that are locked in the center. Overall, if you are a bad jumper the DEX408v2 makes you look good, and if you are already good it makes you look like a pro in the air. 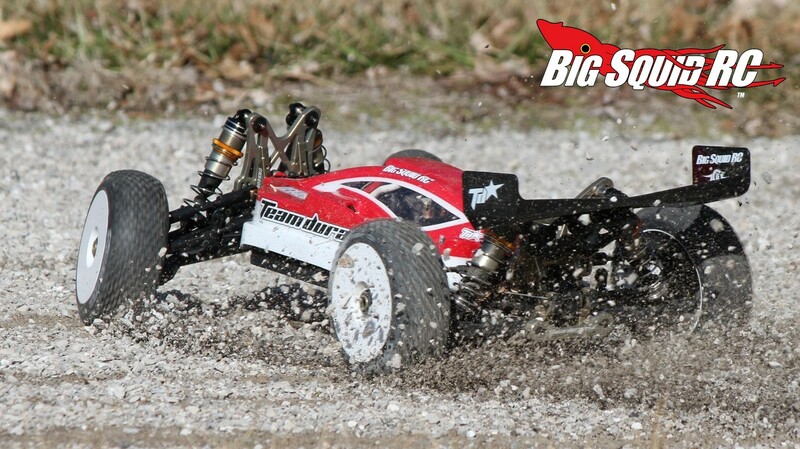 Bumps/Whoops: For years rc manufactures were all about giving the rear of their 8th scale buggies a ton of travel, but the Durango has gobs front and rear. 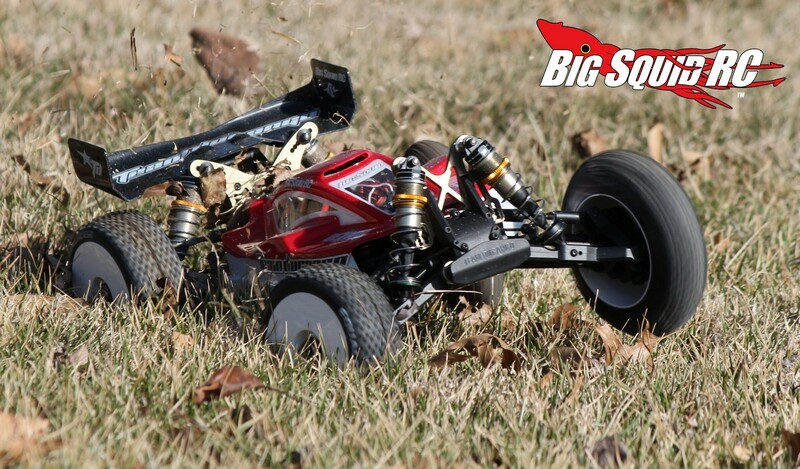 That ultra long travel combined with its HUGE shocks and forgiving chassis yield a great handling buggy in the rough. We had a lot of fun searching out the gnarliest/bumpiest ground we could find then blasting through it pinned with the Durango. On-Road: No, the Durango was not designed for pavement, but it sure jams on it. You can get it to flip by hitting cracks or potholes, otherwise you can pretty much leave it pinned and it stays on its feet. Its ample suspension soaks up road-joints and potholes incredibly well, and it is generally a blast when driven on-road. Grass: The DEX408v2 can jam on grass, it gets good traction and puts a ton of power to the ground. 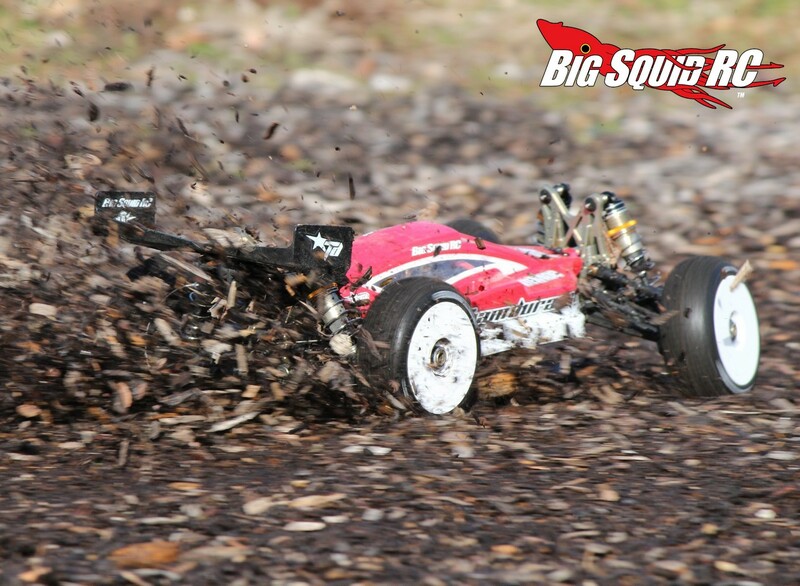 However, it is an 8th scale buggy with a low slung chassis, in taller grass it simply can’t plow through like a truggy or dedicated monster truck can. 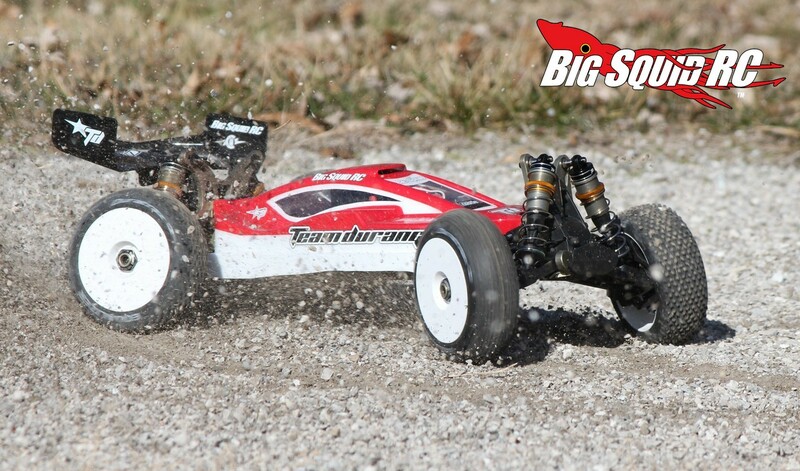 Tires: The Durango doesn’t come with tires so we bolted up some of our favorite all purpose bash tires for 8th scale buggy, Duratrax Equalizers. 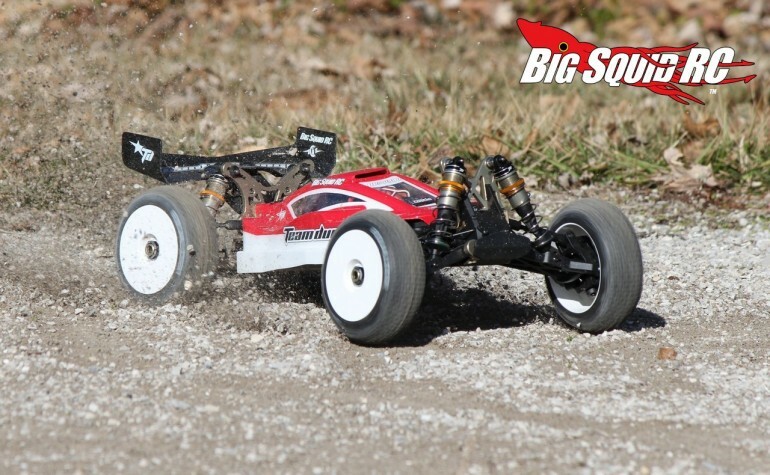 These work well in medium to low bite, loam, grass, and get really good traction on pavement. 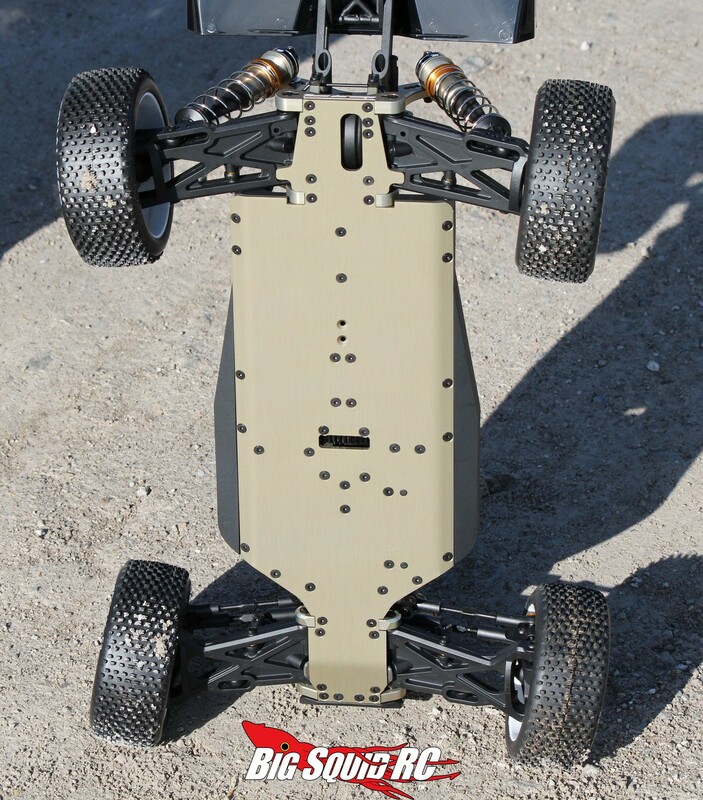 Broken Parts: An 8th scale buggy that makes you feel like Superman results in the “normal” part of our testing going good-bye very quickly. Therefore, most of our testing with the DEX408v2 would have to have been considered extreme. When other people were perfectly downside a big jump on the track, we were hucking over the fence. When we got near a building, we had to jump up on the roof and back off. When we got near the parks playground area, we had to huck over it. You get the point, we basically drove the DEX408v2 like we stole it from the very first pack. The end result? Less breakage than we’ve experienced from a Durango. In fact, after pack after pack of harcore bashing, our DEX408v2 remained alive. 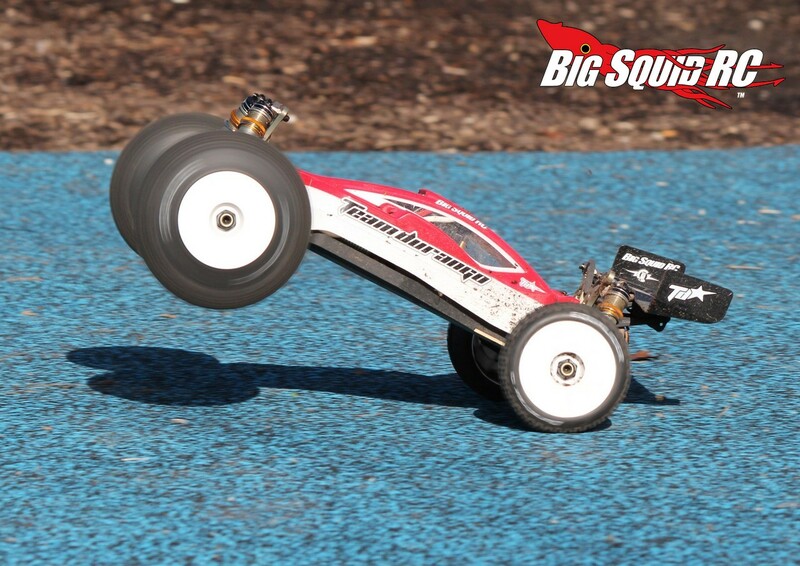 We do have to note that all our test venues were wet/soggy and much softer than they would have been during the summer, but still, landing upside down from 20 feet up is no joke, nor was numerous horrific landings after 120 foot long downhill jumps. We did manage to strip out the stock plastic servo arm, and the buggy finally came to a complete halt after we stripped out its spur gear, but overall, the DEX408v2 is tough enough to be a great basher. The Durango was a kit, how did the build go? 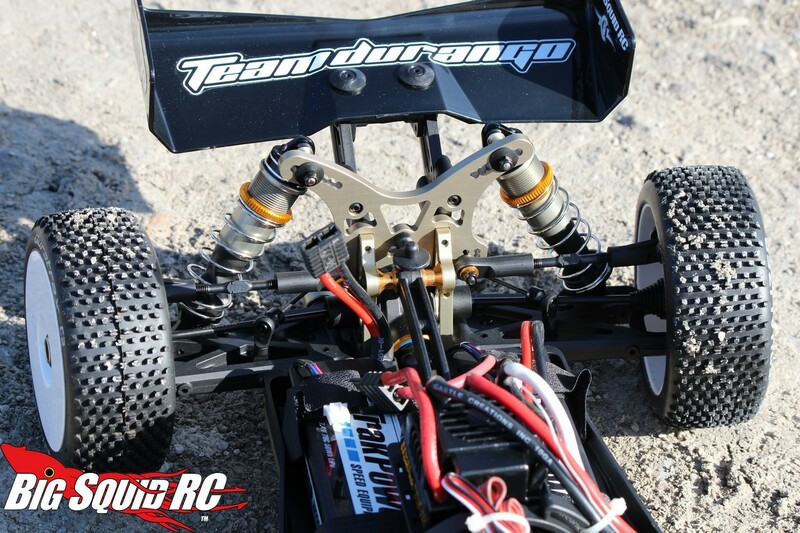 It went smoother than any other Durango we’ve built, and better than most other kits we’ve built lately. Step one in the build doesn’t require you open up 6 bags like other kits do, the Durango crew has really streamlined the build process. The bags are better organized than on previous Durango kits, making the building process a whole lot easier. We did run into one issue during the build, one of the shock caps had bad threading and didn’t want to go on. We tried fixing the threads with a hobby knife, then a file, then with a Dremel, all with no luck. Finally we resorted to going medieval on it and voilà, it finally went on. Thank goodness the body isn’t one of those cab-forward jobs, but it is extremely low slung that can make for some height issues with electronics. Perhaps one of the best attributes of the DEX408v2 is its ability to put down crazy power. We always overpower everything and the Durango left us feeling like we had not thrown enough yank in, a feeling I don’t think we’ve ever had before. 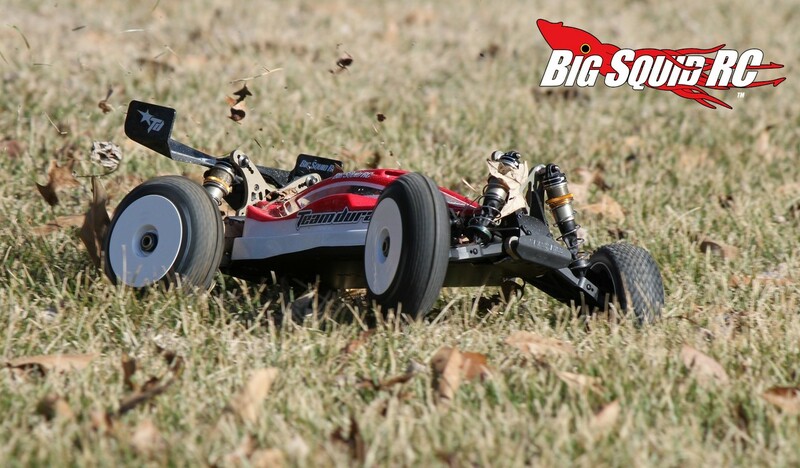 The buggy thrives on being driven hard, the harder you push it, the faster it goes, unlike other buggies that can feel like they are completely overwhelmed when big power is installed. And overpowered we were. 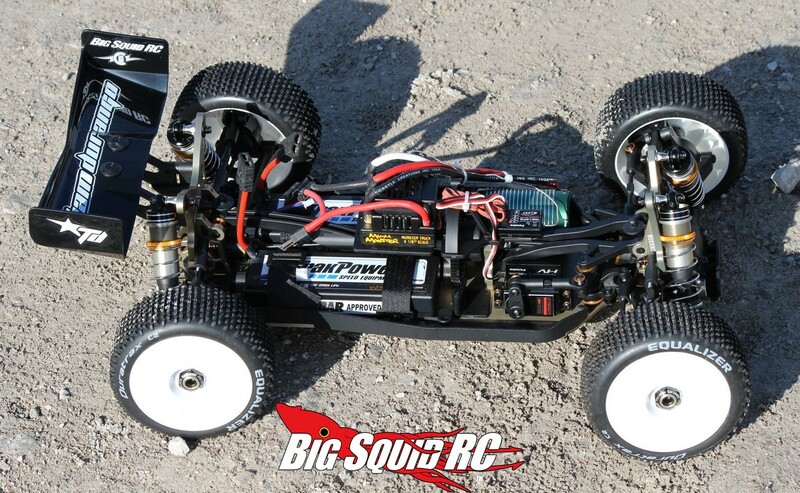 A Castle 2650 on the TrakPower Lipos with a fairly large pinion produced a ton of power in the Durango. We measured top speed at 46 mph, which is much higher than you would gear it for track use, but felt about perfect for bashing with the Durango. 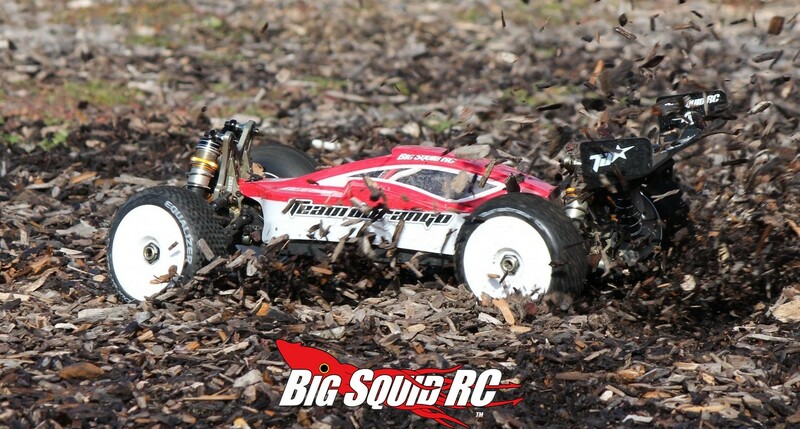 Also on a handling note, we have tons of time with an Associated RC8.2E and a Losi 8ight-E 2.0. The Durango made both of those buggies, especially the Associated, seem hard to drive and less stable. 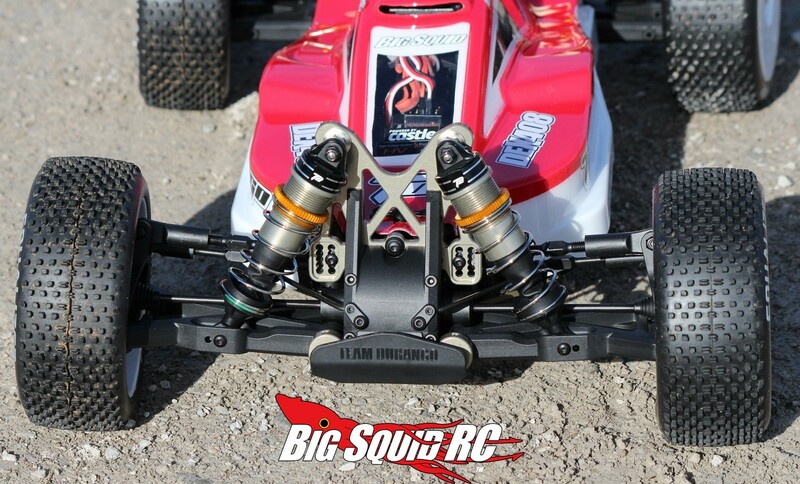 We are also in the process of reviewing the Futaba servo we used in the Durango, and wow, we were very impressed. More on this servo during its review, but the S9353HV had loads of power, was impressively fast, and was buttery smooth across its arc. We attempted to measure runtime with the Durango, but we just couldn’t do it. Normally when that doesn’t happen it means the test vehicle broke, some electronics thermaled-out, or other issues, but with the Durango we just couldn’t drive it continuously until the batteries dumped. We were getting very long runtimes with the TrakPowers and we kept on stopping to move our ramps around, walking to another spot to bash, etc. We were simply having so much fun bashing that we never wanted to bore ourself by just driving around in a small area until the batteries ran out. Yes, we would like to give you guys an accurate account of what kind of runtime to expect from a vehicle, but we got selfish and decided to just drive for fun with the Durango. Best Mod Under $5: Buy some extra shock and diffs oils to dial the Durango into your conditions and driving style. Best Mod Over $5: The DEX408v2 is pretty dialed out of the box but we managed to strip out the stock plastic servo arm. Durango makes a high zoot aluminum unit that will eliminate that problem (#TD340023, $14). Time To Bash: C Going with a kit isn’t the fastest way to get to bashing, but the Durango goes together well. Workability: B The DEX408v2 is well laid out and very easy to wrench on. Car Show Rating: A Our Bash Crew really liked the non-cab-forward body, trick looking shocks & towers, and sharp looking wing on the Durango. Bash-A-Bility: B Ok, so we did strip a spur and the stock plastic servo arm, but otherwise the DEX408v2 was one tough customer. Fun Factor: A Huge power and fantastic handling made the DEX408v2 one of the funnest vehicles we’ve driven. Handling: A The DEX408v2 is one of the best handling rc vehicles that money can buy. It is the best at jumping that we’ve ever tested, one of the best in the corners, and generally excels at ever aspect of handling. Value: B The Durango comes with a $550 price point before what is required to make it ready to jam, and that isn’t a light hit on the wallet. But value isn’t just about how cheap something is, it is how much you get in return. You get some serious premium performance for your cash with the Durango. 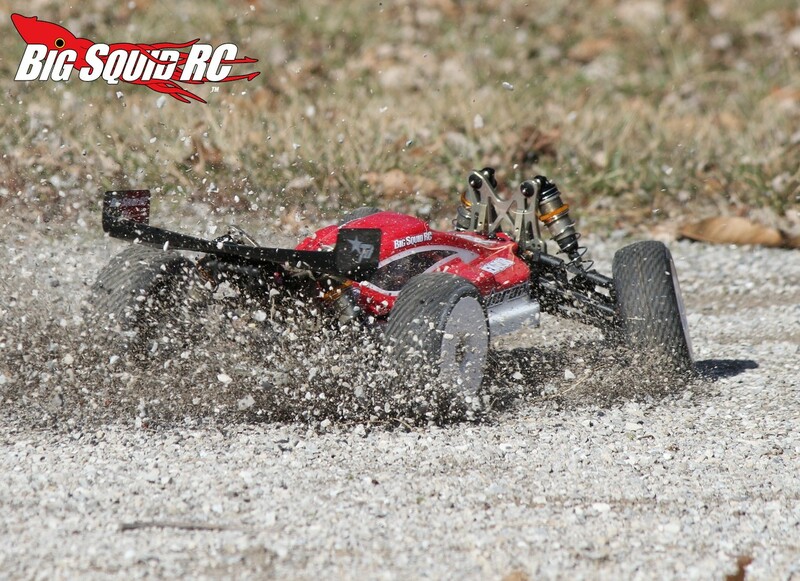 Parts Availability: C Nope, you won’t find Durango parts hanging off the pegs at your LHS like you would with Traxxas, but they are easily available on-line. 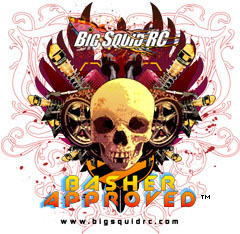 BigSquid Rating: B While the DEX408v2 may have been designed for track use, it is one of those rare machines that can compete at an extremely high level on the track, and also makes a great bash machine. You can go straight from the track, to pounding ramps onto roof buildings, and not have to worry about destroying it. We were very impressed with the Durango and highly recommend it to you. Check out the video below, make sure to watch in HD!